The Pitt women’s basketball team recovered from its most lopsided loss of the season with a resounding 25-point win in game one of the Patrick Harrington Tournament in Niceville, Florida. With eight days of rest following a 91-62 defeat against Penn State Dec. 10, Pitt (8-3) made the trip to Florida for the first of two back-to-back games in the memorial tournament. The Panthers got things started with a 71-46 win over the UTEP Miners (2-8) Monday night for the team’s first win away from home this season. 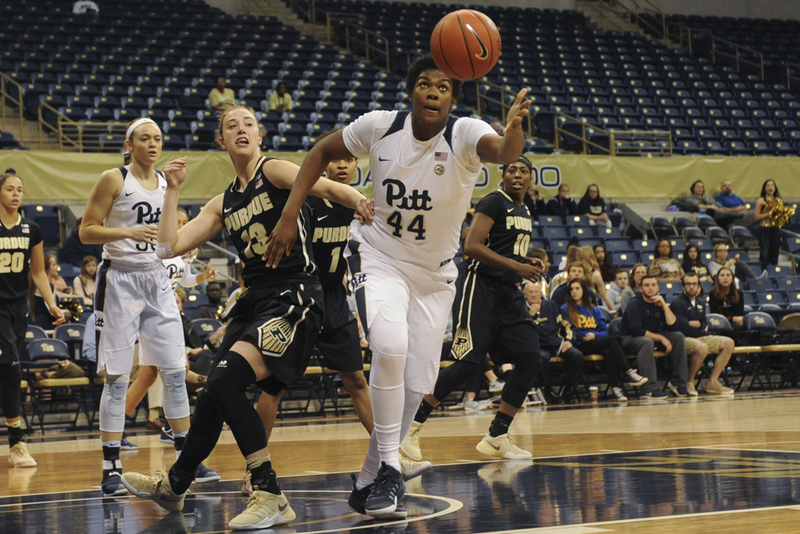 Pitt sophomore forward Brenna Wise and graduate transfer center Brandi Harvey-Carr dominated inside, leading the Panthers with 18 points apiece. Wise chipped in a game-high 10 rebounds for her fourth double-double of the season. Junior point guard Aysia Bugg nailed a pair of mid-range jumpers to get Pitt on the board first, then a jumper by Harvey-Carr made it a 6-0 lead. Wise contributed four straight free throws, then graduate transfer forward Destinie Gibbs — making her first start as a Panther — added two more to pad Pitt’s lead to 10 early on. The Panthers led, 16-8, after the first quarter, then stretched their advantage to 17 in the second for a commanding 37-20 halftime lead. Bugg again got things started with a jumper coming out of the break, then Pitt’s 6-foot-4 center Harvey-Carr drained a 3-pointer to make it a 20-point game. The Miners had their best quarter of the game, putting up 19 points, but they still couldn’t stop the Panthers on defense. The gap remained at 17 with Pitt leading, 56-39, heading into the final quarter. Harvey-Carr opened the fourth quarter with a pair of layups, giving Pitt a 21-point cushion. After UTEP cut it to 16, she drilled another three to make it 63-44. A jumper by Wise pushed the Panthers’ lead back to 21 with six minutes left on the clock. Pitt then locked down on defense, allowing only one basket the rest of the way and finishing the game on a 6-0 run to close out the dominant 71-46 win. The Panthers will remain in Niceville to conclude their three-game road trip against McNeese State. Pitt will host the Cowgirls in game two of the Patrick Harrington Tournament at 6 p.m. Tuesday, Dec. 20.